The external respiration, or the respiratory gas exchange, the intake of oxygen from the environment and the release of carbon dioxide. The internal respiration, a biochemical process in which the organic compounds are oxidized to low-energy substances for the purpose of acquiring ATP. The gill breathing, in which the gas exchange occurs through fine skin protrusions supplied with blood (gills). They are found in many invertebrates and in fish. 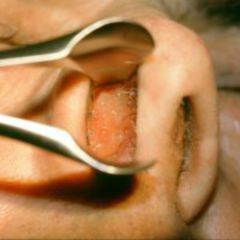 The tracheal respiration, which occurs through tubular inversions (spiracles) in the body skin. This type of respiration is found in insects. The lung respiration, in which respiration occurs with the aid of bags (lungs) embedded in the body. This type is found in breathing snails and in amphibians, reptiles, birds and mammals including human beings. See Lungs. In humans, the term respiration denotes the drawing of breath by the expansion and contraction of the ribcage (chest breathing) and the diaphragm (abdominal breathing). Thereby, the breath is drawn in through the airways into the lungs, where the gas exchange takes place. 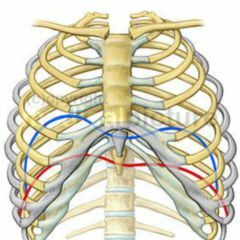 During inhalation (inspiration), the volume of the ribcage increases by the constriction of the chest muscles and the diaphragm. Thereby, the lungs expand causing a low pressure, and air flows into the lungs. The pleurae (located between the lungs and the ribcage) and the diaphragm respectively allow the lungs to expand with the ribcage. The membrane surrounding the lungs and on the inner side of the ribcage (pleura) as well as on the diaphragm and the pleura parietalis stick to each other like glass plates with a liquid in between. On the one hand, this enables the repositioning of the concerned structures, and on the other, respectively hinders a collapse of the lung during low pressure and enables its expansion. 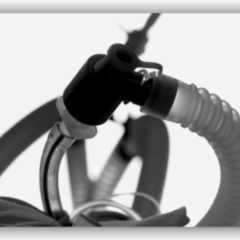 During exhalation (expiration), the lungs constrict again causing high pressure and the air goes out through the airways. The respiration is controlled by the brain and the breathing center in the medulla oblongata. The reaction of the chemo receptors to the carbon dioxide content (and/or carbon dioxide partial pressure) of the blood is the crucial factor. If it rises above a certain threshold value, the stimulus to breathe is initiated. Receptors, which react to the pH value of the arterial blood as well as to the lack of oxygen (hypoxia), have only a secondary significance as a stimulus to breathe. about 40 per minute in babies. The tidal volume of a resting adult amounts to between 0.4 and 0.6 liters. Internal respiration is the release of energy from compounds that can metabolize after gaining energy. Thereby the redox equivalents such as NADH or FADH2 emerge, whose energy can be transferred to ATP in another step by oxidation of the inhaled oxygen. The internal respiration requires the four complexes of the so-called respiratory chain and takes place in the inner membrane of the mitochondria.